How’s this for a book right up my alley? A few months ago, I stopped by Ukazoo, my favorite local used bookstore in Towson (um, the only used bookstore in Towson), and did my usual tour of the writing/reference books. I was pleased to find this gem for a fraction of its original price. 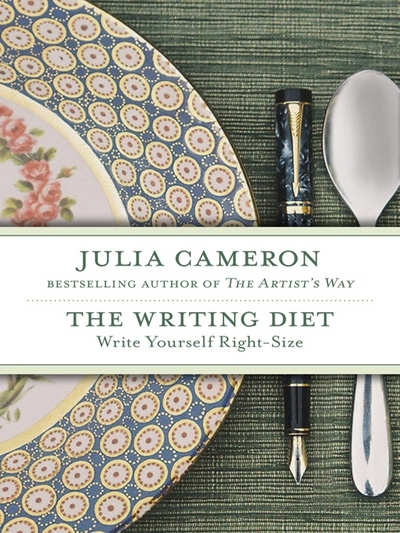 Julia Cameron is most famous for her bestselling book, The Artist’s Way, which takes readers through a 12-week process to unlock their creativity and discover their authentic selves. It’s a must read for every person who is interested in living a more fulfilling life. This book, though, I had not yet heard of. Yesterday, I was looking over the books on my shelves, and this one stood tall among all the others. It is the perfect read to get me going on this new journey. Writing makes us conscious. Once we are conscious, it is difficult to act out in unconscious ways. Once we catch on that we are overeating as a blocking device, it becomes harder to reach for food and easier to reach for words. When a Snack Attack hits, you can take yourself to the page instead of to the refrigerator. When you do, your creativity will respond with an increased flow of insights and ideas. So that’s what I’ve done for most of the day. My daybook is filling up with words instead of my body filling up with calories. This is not a replacement for exercise; in fact, writing is a pretty sedentary act. If it keeps me out of the kitchen, though, it’s a powerful tool that will help me immeasurably (well, I take that back; I hope the measurement of what I lose is significant). I am curious how applicable this technique is for other behaviors we wish to change. . .Perhaps this will be the subject of another day’s post.